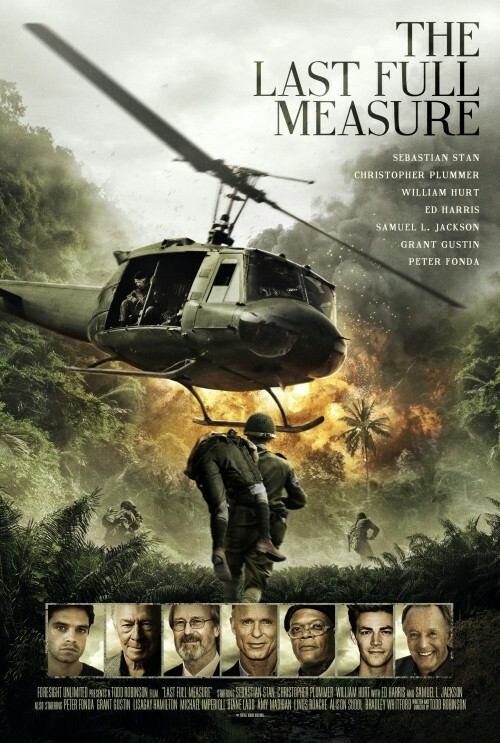 A movie made for me, The Last Full Measure has a cast that I probably dreamt of. If you’re a fan like me, you probably know when your favorite actor has movies coming. I’ve known about The Last Full Measure for quite some time, and for a while, it seemed as if we’d never see this movie. Lo and behold, at the Toronto International Film Festival this year, it was announced that Roadside Attractions (a sister company to Lionsgate) had purchased the distributing rights to the film. Following the true story of William Pitsenbarger, who is played by Jeremy Irvine, the film is set around Pitsenbarger’s comrade in arms (William Hurt) and father (Christopher Plummer) trying to get him the Congressional Medal of Honor. With the help of investigator Scott Huffman (Sebastian Stan), the two want to honor William in the way they see fit. I’ve been following the movie’s journey to the screen not just because I’m a fan of Sebastian Stan, but rather because this movie has an insane cast overall. From William Hurt (who many know from The Big Chill and who plays General Thaddeus Ross in the Marvel Cinematic Universe) to Christopher Plummer (yes, Captain Von Trapp is in this movie, too) to Samuel L. Jackson, Ed Harris, and Grant Gustin, it’s filled with dream actors. No really, this cast list is so insane that I still think I’ve been dreaming and it isn’t really being made. With heavy hitters, new loves, and a story that is going to inspire many, The Last Full Measure promises to be an amazing film. Also, Sebastian Stan wears a lot of polos in this movie and I don’t need that in my life but here we are. Todd Robinson also wrote the script, as well as directed the film. It’s clearly a passion project, telling this story of a wonderful man who dedicated his life to saving those soldiers alongside him in the Vietnam war and it will be a wonderful film to see.